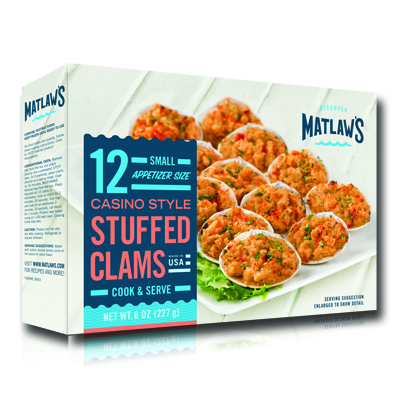 Cassino style stuffed clams make the perfect pickup for you next dinner or party platter! For food safety and quality, follow these cooking instructions. Cook to 160ºF internal product temperature. CONVENTIONAL OVEN: Remove tray from the box and place directly into a preheated 375°F oven. Or if preferred, place clams directly on a baking sheet. Cook for 30 minutes. MICROWAVE: Remove tray from the box. Place tray with all 12 clams in microwave. Cook on HIGH for 2 minutes, 30 seconds. Turn tray and cook for an additional 2 minutes, 30 seconds. Let stand for 1 minute. Product was tested using an 1100 watt oven. Cooking times may vary. CAUTION: Product will be very hot after cooking. Refrigerate or discard leftovers. SERVING SUGGESTIONS: Baste with butter; drizzle lemon juice or hot sauce for extra flavor.